Lemons have a universal appeal. They are popular across all age groups, genders and ethnic groups. Use their familiarity and their appeal to get them moving out the door. Lemons offer a host of health benefits that have gained attention recently. They provide a hefty dose of vitamin C, an antioxidant that can help fight cancer and boost the immune system. The citric acid in lemons can help dissolve gallstones, calcium deposits and kidney stones. Lemons have antibacterial properties and can be used to get rid of odors and germs. The rutin found in lemons has been shown to improve eye health. 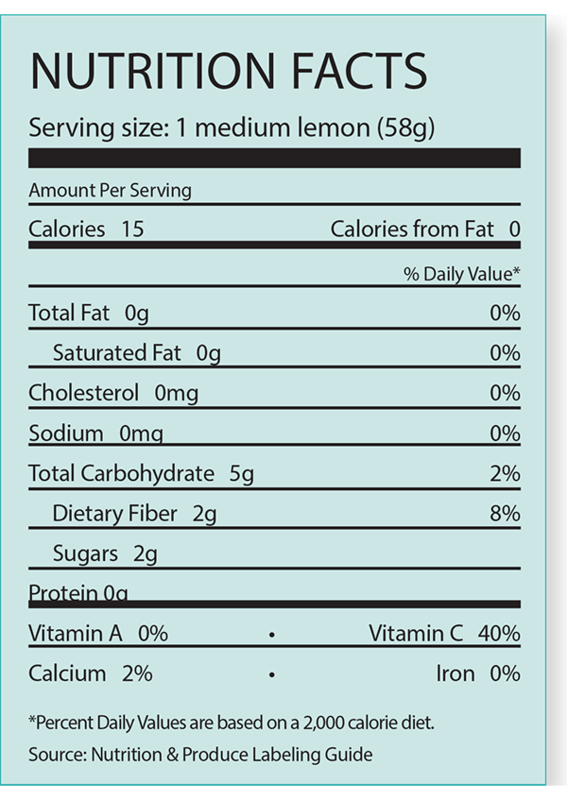 The U.S. Food and Drug Administration has approved the following nutrient content descriptors for lemons: fat-free, saturated fat-free, very low sodium, cholesterol-free, low in calories, and high in vitamin C.
For the fourth straight year, lemon sales rose, jumping more than 5% in 2017. Volume rose 6.5% while retail prices held mostly steady. Lemons are either an ingredient or a garnish, so they have plenty of cross-merchandising opportunities, including fish, pie crusts, juicers, peelers and salad vegetables. Lemons’ citrusy goodness is available year-round. Include them in lots of seasonal promotions. Fall: Promote lemons as an important ingredient in salsa and guacamole for football game day parties. Winter: Nothing says the holidays like pie. Include lemons in holiday promotions as an ingredient in lemon meringue pie and other baked goods. Spring: Lemons are a natural garnish for drinks and salads. They also pair well with fish. Promote them in the springtime along with the seasonal catch in the seafood department. Summer: Nothing says summer like lemonade. Make lemons the centerpiece of a lemonade stand promotion. Cross-merchandise them with juicers and sugar. Promote the health benefits of adding lemon to a glass of water. Lemons can be displayed unrefrigerated if you sell a lot. If your supply does not turn over every day, keep them refrigerated. Include different lemon sizes on your display. Consumers looking for lemons as an ingredient will want a different size lemon than those looking for a garnish. Carry both bulk and bagged product to appeal to as many consumers as possible. Use lemons’ bright yellow color to create an attractive display by placing them next to avocados or broccoli. Lemons paired with lettuce create an eye-catching display, as well. Add some lemons to a display with tomatoes and avocados to remind consumers to use lemons in salsa and guacamole. While lemons are protected by their peel, wash them before cutting to avoid transferring bacteria on the skin to the inside. Sprinkle lemon juice over dishes with sliced apples and bananas to keep the apples and bananas from turning brown. Lemon juice can also be used to hold the white color of potatoes, cauliflower and turnips. Substitute lemon juice for vinegar for a different flavor. Add lemons to drinks and salads as a garnish. Lemons work in a whole host of baked goods. Use lemon zest to add some zing and garnish to an entrée. 42-lb. 4⁄5-bushel cartons 38-lb. cartons 36-lb. cartons/crates RPC 6416, 6419, 6420, 6423, 6425, 6426 Foodservice packs Lemons are available in foodservice packs containing 2-, 3- and 5-lb. cartons, as well as mini-pack cartons that average up to 9 lbs. Temperature: 45 to 48 F, 7 to 9 C Relative humidity: 85-90% Mist: lightly Typical shelf life: several weeks if properly refrigerated Odor producer (Do not store or transport odor-sensitive items with commodities that produce odors.) Highly sensitive to freezing injury. (Likely to suffer injury by one light freezing.) Susceptible to chilling injury (Damage sometimes is not apparent until produce is returned to a higher temperature.) Shoppers can keep lemons at room temperature for several days. Lemons can also store for one to five months. 48% of consumers said they purchased lemons in the past year. Consumers living in the West are the most likely geographic region to purchase lemons. Women are 23% more likely to purchase lemons than men.